The Trump administration's effort to expand offshore oil and natural gas exploration in federal waters creates not only long-term risks from climate change and oil spills, but also more immediate threats to ocean life. Offshore oil and gas exploration uses deafening seismic airgun blasts that harm marine mammals. The oil industry is now seeking federal permits to do seismic testing even in areas where offshore drilling is currently prohibited, including the Atlantic Ocean and eastern Gulf of Mexico. Department of the Interior environmental studies estimate that seismic proposals now under review would cause more than 31 million instances of harm to marine mammals in the Gulf and 13.5 million harmful interactions with marine mammals in the Atlantic, killing or injuring 138,000 dolphins and whales — including nine endangered North Atlantic right whales, whose calving grounds are off Florida's coast. Hundreds of communities along the East Coast have expressed their opposition to seismic testing and the offshore drilling that it could lead to. Seismic exploration surveys generate the loudest human sounds in the ocean, short of those made by explosives. The blasts — which can reach more than 250 decibels and be heard for miles — can cause hearing loss in marine mammals, disturb essential behaviors such as feeding and breeding, mask communications between individual whales and dolphins, and reduce catch rates of commercial fish. Adding insult to injury, the Trump administration is even proposing to amend the guidance document that assesses seismic damage to wildlife, part of its effort to undermine science. Seismic testing involves blasting the seafloor with high-powered airguns (a kind of powerful horn) every 10 seconds and measuring the echoes with long tubes to map offshore oil and gas reserves — in the process disturbing, injuring and killing marine mammals and other wildlife around the clock for years on end. While a Bureau of Ocean Energy Management factsheet describes the technology as “state-of-the-art computer mapping systems,” seismic testing is actually a blunt-force weapon introduced in the 1920s that was augmented by computer analysis starting in the 1950s. Expanding offshore drilling into the Atlantic and eastern Gulf creates a higher risk for oil spills, more polluted beaches and waters, more industrial equipment, and fewer pristine places for wildlife and people. Extracting and burning the 4.72 billion barrels of oil and 37.51 trillion cubic feet of natural gas that the federal government estimates is under the Atlantic would also significantly worsen the climate crisis. So there's no good reason to be subjecting ocean life to these deadly seismic blasts. The Center has been working hard to save marine mammals from deadly and disturbing seismic surveys since the early 2000s, and we're still at it. 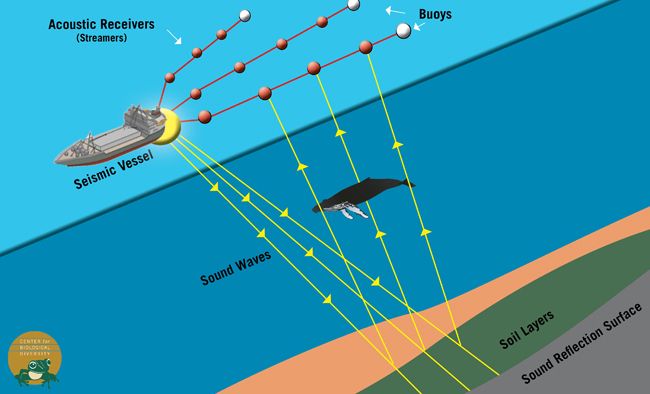 Learn more about seismic testing and other forms of ocean noise now. Seismic surveys involve powerful airguns blasting the seas at 10-second intervals and measuring the echoes off the sea floor to help map offshore oil and natural gas fields — in the process disturbing, injuring and killing marine mammals and other wildlife.